In performing research on Antonio Meucci, Basilio Catania has also investigated on several other telephone pioneers, such as Charles Bourseul, Philipp Reis, Innocenzo Manzetti, Elisha Gray, Graham Bell, Thomas Edison, Amos Dolbear, Daniel Drawbaugh and others. Innocenzo Manzetti was one of the first considered, also because his birth place, Aosta, is at a very convenient distance from the Turin area, where Basilio Catania resides. The result of this research was that Innocenzo Manzetti worked, from 1864 to 1865, on the invention of a telephone, composed by a make-and-break transmitter and a magnetostriction receiver, similar to the device invented and researched upon by the German Philipp Reis from 1858 on. Manzetti probably did not know of the Reis telephone, though the latter was reported in the press since 1861. Both telephones, however, were only suitable for transmitting single tones as well as some tunes but could not satisfactorily transmit the consonants -- and barely, the vowels -- of the human speech. On the contrary, Meucci's system, as finalized in 1870, could perfectly transmit speech and featured some fundamental techniques for long distance communication. Manzetti telephone was publicized in generic terms on several newspapers in 1865. Antonio Meucci read the notice and wrote a letter to the editors of two newspapers, claiming his priority and quoting his first experiment in Havana of 1849. Nevertheless, being a true gentleman and an Italian patriot, he wrote "I do not pretend to deny to Sig. Manzetti his invention, but I only wish to make it evident that two thoughts can be found to contain the same discovery, and that by uniting the two ideas one can more easily reach a certainty about a thing so important." The article reported below deals more extensively with Innocenzo Manzetti's life and work and is extracted from vol. 1 of Basilio Catania's book "Antonio Meucci - L'inventore e il suo tempo," published in 1994 by Seat, Rome, and translated in English. Innocenzo Vincenzo Bartolomeo Luigi Carlo Manzetti was born in the town of Aosta on 17 March 1826. After primary school, he went to the Saint Bénin boarding school run by the Jesuits, and then to Turin, where he obtained a diploma as a land surveyor, thereafter returning to Aosta. For a time he worked in the Civil Engineering Corps. He became interested in acoustics, mechanics, hydraulics, electricity and astronomy. It is said that he only slept an average of two hours a day, working and experimenting all the rest of the time. His first work, which brought him much fame, was a flute-playing automaton, built in 1849. It was in the stylized shape of a man, life-size, seated on a chair with a flute in hand. Hidden inside the chair were levers, connecting beams and compressed-air tubes, which made the automaton's fingers move on the flute keys, as well as its lips, according to a program mechanically recorded on a cylinder, similar to those used in player pianos. The automaton was wound like a clock, and could perform twelve different arias. At the beginning of its performance, the automaton would rise from the chair, bow its head and roll its eyes. In his workshop, Innocenzo Manzetti constructed geodetic instruments that he needed for his work as a land surveyor and also musical and scientific instruments for third parties. He also built a bicycle and a piano. He amused himself by inlaying precious miniatures in ivory or bone, often using a special pantograph conceived by him for the reproduction of basreliefs on marble, ivory or wood, scaled at pleasure. Subsequently, Manzetti succeeded in making his joueur de flûte play any piece executed by a musician on an organ, by making the latter's keys mute and connecting them to the automaton's finger controls. He also built, as a toy for his daughter, a wooden flying parrot (perroquet en bois volant) also mechanically wound, which began by beating its wings, then slowly rose into the air and hovered for two or three minutes, then went to settle on a shelf. In 1855 Manzetti invented an ingenious hydraulic machine to empty water from the wells of the Ollomont mines, which were otherwise unserviceable. His construction is minutely described by his clergyman friend Edouard Bérard in La feuille d'Aoste in 1862. In 1864, just after marrying Miss Rosa Sofia Anzola, he built a steam-powered car, 27 years ahead of the one realized in Paris by Serpollet, and an earth telescope with three converging lenses that allowed to observe a lizard's movements at a distance of 7 km. He also built a pendulum watch which could be wound to work for one year. Tancredi Tibaldi, a personal friend of Innocenzo Manzetti, recounted, in 1896, that the telephone idea came to Manzetti out of the desire to make his automaton talk just as he made him play. That is, analogously to the execution of a piece played by another person, he wanted the automaton to pronounce words spoken from a distance by another person. Innocenzo's brother, Anania, recounted that the inspiration came from the memory of their childhood games with the chapeau à gibus (a sprung top hat that could be flattened for carrying under one's arm) that they used as a loudspeaker to scare their peers by speaking from another room into another hat, connected to the first with the usual system of the taut string. Manzetti called his first telephone model, made in 1864, télégraphe parlant (speaking telegraph). It was never patented nor presented at conferences or described in the newspapers by Manzetti himself, because he was timid and retiring and, moreover, did not care about money. All the same it was spoken of, though in generic terms and with a nearly identical text, in the following papers, probably informed by Manzetti's friends or after reading the first news in the Aosta's paper L'Indépendant of 29 June 1865: Il Diritto of Turin on 10 July 1865; La Feuille d'Aoste on 25 July 1865; L'Italia of Florence on 10 August 1865; L'Eco d'Italia of New York on 19 August 1865; Il Commercio di Genova of Genoa on 1 December 1865; the Petit Journal of Paris on 22 November 1865; La Verità of Novara on 4 January 1866; and again Il Commercio di Genova on 6 January 1866. «A new discovery immensely fruitful in its possible applications both in the fine arts as well as the industries is going to augment the marvels of this century; and this is the transmission of the sounds and of the spoken words by telegraph. Manzetti transmits directly the word by means of the ordinary telegraphic wire, with an apparatus simpler than the one which is now used for dispatches. In its second announcement, published on 22 August 1865, La Feuille d'Aoste reported the following news: "
It is rumored that English technicians to whom Mr. Manzetti illustrated his method for transmitting spoken words on the telegraph wire intend to apply said invention in England on several private telegraph lines." It is also known that Antonio Meucci, having read said news in L'Eco d'Italia, published in New York, sent a letter to Il Commercio di Genova, as well as to L'Eco d'Italia, claiming his priority and quoting his experiments, made in 1849 in Havana. Il Diritto on 21 December 1865, confuted Meucci's argument, writing in defense of Manzetti, and especially exalting the properties of a (vaguely described) mechanical mouth used by Manzetti, "certainly more practical than Meucci's system which, requiring one to hold the conductor between one's teeth, impeded the speaker's proper elocution." Il Diritto also made a point of underlining how Meucci's suspicion that his friend Enrico Bendelari, going to Italy in 1860, might have unveiled the news of Meucci's discovery - which might then have been picked up by Manzetti - was denied in a letter sent by Bendelari to Meucci on 15 September 1865. Besides, Meucci's expressions toward Manzetti were very cordial, admitting that "two thoughts can be found to contain the same discovery," as we have reported in the foregoing. "The speaking telegraph consisted of a funnel-shaped cornet in which was placed, transversally, an iron lamina, in the shape of a very thin plate. This plate easily vibrated under the impulsion of the sound waves coming from the bottom of the funnel. In the cornet, there was also a magnetized steel needle, running inside a bobbin, vertically placed with respect to the vibrating lamina and very close to the same. From the bobbin or spindle started a silk-coated copper wire, the other end of which was connected to a bobbin placed in an apparatus identical to that described above. From this second apparatus started another electric wire, which was connected to join the former. Now, if in the vicinity of the lamina of one of the cornets a sound was emitted, this sound was immediately reproduced by the lamina in the other cornet. The communication between the laminae of the two cornets took place thanks to the principle that the vibrations of an iron plate in front of a pole of a piece of magnetized iron produce electric currents, the duration [i.e. frequency, Editor's note] of which is the same as that of the motion of the vibrating lamina. In a word, the acoustic waves produced by speech, voice, sound into a cornet were transformed in the apparatus into electric waves, and then transformed back into acoustic waves in the other cornet." The drawing reproduced here below -- supposed to be consistent with the above notes of Dr. Dupont --is taken from a recent book, authored by Caniggia and Poggianti (see bibl.). Both the drawing and the description above seem to refer to a "make-and-break" telephone transmitter and to a magnetostriction receiver, quite similar to those developed by the German Johann Philipp Reis in 1861 (probably, without Manzetti being aware of). In fact, in both cases we have a needle, as a magnetic core, against which an iron plate vibrates. And, due to the known limitations of the make-and-break systems, the instrument showed defects in the transmission of articulated words, that Manzetti was not yet able to eliminate, as was written in L'Eco d'Italia. Another confirmation of this hypothesis, comes from the clergyman Bérard who declared that words containing the letters c, f, g, j, l, u, v, x, and z could not be transmitted and that, consequently, it was impossible to hold a complete conversation. Another posthumous description of Manzetti's telephone came from a short notice in Il Progresso Italo-Americano of New York on 12 January 1937, by a certain Italia T. Gronbony. She affirmed that a model of Manzetti's telephone was on display in the cabinet of Physical Sciences of the "Accademia C. D. Andreis," and that "it is composed of a permanent steel magnet shaped in a narrow V, about 15 centimeters long, enclosed in a wooden sheath." From this notice, we can only learn that one of the models contained, as a core, a permanent steel magnet shaped in a narrow V about 15 centimeters long, instead of a magnetized steel needle (perhaps also 15 centimeters long), not a big difference. Count Théodose Du Moncel (see bibl. ), who studied Manzetti's discovery fairly thoroughly, concluded, along our own hypothesis, that Manzetti's telephone was similar to Reis's. Finally, the Royal Commission instituted in Italy in 1910 with the task, among others, of verifying priority on the invention of the telephone, thus expressed itself regarding Manzetti (see bibl. ): "Innocenzo Manzetti of Aosta had invented something similar [to a telephone] except that no trace of the principle on which it was based has remained." 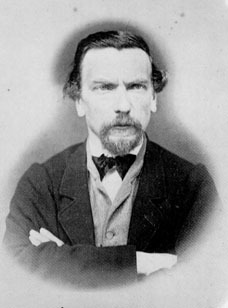 After 1865, the press no longer wrote of Manzetti's télégraph parlant, nor of a practical application for it, which leaves us to suppose that it was abandoned. Only on 30 January 1878, the Fanfulla of Rome reminded its readers - a year after the death of the Aostan inventor - that not all credit was owed to the most acclaimed Alexander Graham Bell. Manzetti died poor and unrecognized in Aosta on 17 March 1877 on the exact day of his fifty-first birthday, one year after the death of his second and last daughter, Marina Fortunata, who strikingly resembled him and whose loss had caused him enormous pain. The first daughter, Maria Sofia, had died in 1867, at the age of two. The obituary that appeared in the Echo du Val d'Aoste on 19 March 1877, thus described Manzetti's character: "
" Tibaldi (see bibl.) describes him as "
Nearly three years after Manzetti's death, precisely on 7 February 1880, two Americans from New York, Prof. Max Meyer, an American citizen residing in Paris and Sir Horace H. Eldred, a New York Telegraph inspector, accompanied by the already cited clergyman of the Aosta Cathedral, Édouard Bérard, went to visit Manzetti's widow, Mrs. Rose Anzola, and Manzetti's brother, Louis, with the aim of purchasing the rights, as well as the documents and models of Manzetti's télégraph parlant. On the same day a deed was signed, at the offices of the notary public César Grognon, by which the two Americans committed to pay ten thousand Italian lire of the time (slightly over 40 million lire, or 30,000 dollars, in 1990) to the widow, "as soon as it was established that Innocenzo Manzetti was the first inventor of the telephone." An analogous document was signed with the brother, Louis Manzetti, for the sum of five thousand lire. After signing the deed, the two Americans obtained drawings and models from the widow and the brother, for the sum of thirty French francs of the time (around 1 million lire, or $830, of 1990). The clergyman Bérard was accused by Prof. M. P. Fornari of the University of Milan of having made a deal with the two Americans, supposed to be emissaries of the American Bell Telephone Company, in disfavor of Manzetti's widow. His accuses appeared in two articles on L'Educatore Italiano of Milan on 13 and 20 December 1883, which were later translated into French and published in three parts (18 and 25 January and l February 1884) by the Aosta Valley's paper Le Patriote. Bérard defended himself with long arguments - published in three more issues of Le Patriote (15 and 18 January and 14 March 1884) - essentially taking Graham Bell's side and diminishing the importance of Manzetti's télégraph parlant. Moreover, he had Manzetti's widow release a statement in which she affirmed, among other things (translation from French): "
" Thus, Manzetti's widow did not mention any iron plate, nor the magnetized needle with bobbin, though the shape of the instrument seems to comply fairly well with that of the drawing shown above. In another letter written by Baron B. C. Bich of Aosta to the clergyman Bérard, dated 28 December 1883, it was specified that the few remains of Manzetti's telephone, consisting of "a little pasteboard cornet with a little iron plate" had not been entrusted to the Americans but to the Rev. Father Denza, Physics professor at the Moncalieri boarding school, who intended to pay honor to Innocenzo Manzetti. The clergyman Bérard had the above letter published and further declared that the two Americans were by no means emissaries of the Bell Company and that, on the contrary, they intended to use the evidence gathered in Europe to have the Bell patents annulled. Nevertheless, subsequent searches for the two Americans, made by order of Manzetti's brother, Louis, both in New York and in Paris (where Prof. Meyer had said he resided), yielded no results; the two seemed to have vanished, thus leaving a shadow of doubt on the assertions of clergyman Bérard.